No offense to McFarlane Toys, who’ve done a great job with the various franchise figure lines over the years, but Halo is much too big a property for a relatively niche company to handle. Now Mattel’s got the master license, and they’re putting it to good use. Mattel and Halo aren’t exactly strangers. Mattel subsidiary Mega Brands has been making Halo Mega Bloks sets for years. Plus Mattel’s Nerf rival BoomCo has been putting out Halo style dart guns recently. Those two lines will continue to put out building sets that LEGO fans turn their nose up at and guns that Nerf wielders loathe. Where Mattel’s new lineup, featured this weekend during Toy Fair 2016 in New York City, really shines is the action figures. One of the jerks that regularly kills me in Halo 5 multiplayer matches. Where McFarlane Toys figures went for a somewhat more gritty feel, Mattel’s first figures are bright and shiny figures in sleek metal armor. The 6" figures feature mix-and-match armor pieces, swappable weapons and more than 30 points of articulation. They look much more like toys to play with than toys to display, though I’m sure they’ll still look fantastic on a shelf. Halo 6″ Figure Assortment (SRP: $19.99) –All new 6” collectible action figures series brings the Halo universe to life! More than 30 points of articulation in a highly poseable form. Each figure includes mix-and-match armor suit and 1-2 iconic, interchangeable weapons so you can customize your figure for battle. Along with the 6" figure line there’s also a slightly cheaper 12" figure assortment, with less articulation but much more presence. Halo 12″ Figure Assortment (SRP: $9.99) – Step into the Halo action with the all new Halo 12” figure assortment. Each figure stands 12” tall and includes 15 points of articulation. Figures include one iconic, interchangeable weapon that can store on back of figure and authentic, game-inspired design based on characters from the Halo universe. They’ve even got a 12" Master Chief with a scale Warthog. Halo Warthog + 12” Master Chief (SRP: $49.99) – Step into the Halo universe with the Warthog deluxe vehicle and figure. Recreate epic missions with the UNSC’s premier ground transportation vehicle in epic scale, complete with a rotating weapon turret to fit your favorite Spartan or Covenant figures. Includes fully articulated, removable 12” Master Chief figure. I’m pretty excited as well. Mattel is hitting Halo from all sides in 2016—BoomCo guns, Mega Bloks, Tyco remote control vehicles and figures inspired by both Halo 5: Guardians and the upcoming Halo Wars 2. I’ll be getting a closer look at their offerings this weekend during Toy Fair. For now, scroll down for a closer look at some of the upcoming playthings. BoomCo. Halo Brute Spiker (SRP: $19.99) – Featured in the upcoming Halo Wars 2 and includes the QwikClip system, designed not to jam, for quick-fire action and rapid reloads. Comes with authentic, intimidating Brute Spiker blades and includes 6-dart QwikClip and 6 darts. BoomCo. Halo UNSC MA5 Blaster (SRP: $49.99) – One of the most iconic, go-to weapons of choice for the Master Chief. Includes true-to-game features – rapid-fire action, interchangeable clips and extra QwikClip storage in stock. Its size, speed and QwikClip compatibility make it a must-have item. Halo Ghost Vehicle + 6” Figure (SRP: $29.99) – Step into the Halo universe with the Ghost vehicle and 6” Elite Officer figure. Includes highly detailed 6” figure with removable armor and weapon. Halo Energy Sword (SRP: $49.99) – LFX and motion-activated SFX deliver life-like Halo experience, includes “Try Me” feature. Recreate epic Covenant vs. Spartan battles with Halo-inspired Covenant deco and design. Halo Mega BloksDual Mode UNSC Warthog (SRP: $29.99) – Twice the firepower makes for twice the ride. This buildable ground vehicle comes ready to deal out double the devastation, with a dual-mode capability that lets you switch between either a Gauss Cannon or Rocket Launcher as your turret-mounted weapon. Halo Mega Bloks Heroes Asst. 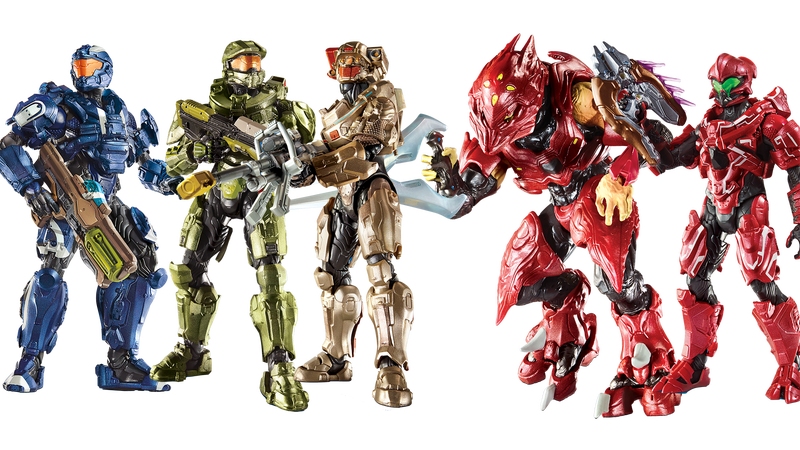 II (SRP: $4.99) – Legendary Spartans assemble with Halo Heroes Assortment by Halo Mega Bloks that includes Sgt. Forge, Spartan DeMarco, ODST Romeo, and the multiplayer armors: Spartan Scout, Spartan Oceanic, and Spartan Gungnir. Packed with additional detail and iconic weapons, each of these highly collectible heroes comes with detachable armor and can be posed on a deluxe buildable display stand. Halo Mega Bloks UNSC Vehicle (SRP: $69.99) – Batten down the hatches with this new UNSC vehicle by Halo Mega Bloks. Rigged with ironclad defenses, this buildable, eight-wheeled artillery tank comes fully loaded with a massive, pivoting cannon. Build the vehicle, and brace your Spartan for an attack from the approaching Covenant Brutes. Tyco Halo Radio Control Vehicle *product title pending* (SRP: $29.99) – All new Halo Radio Control vehicle is fully functional with forward/backward and right/left steering capabilities. Tyco Halo Warthog Light Reconnaissance Radio Control Vehicle (SRP: $29.99) – The Warthog Light Reconnaissance Radio Control vehicle is fully functional with forward/backward and right/left steering capabilities. Tyco Halo Warthog ONI Anti-Tank Radio Control Vehicle (SRP: $49.99) – The deluxe Warthog ONI Anti-tank Radio Control vehicle is fully functional with forward/backward and right/left steering and missile firing capabilities.